Conflict over a meeting room or event venue can be resolved with this printable complaint letter. For three years my friends and I have enjoyed our Monday afternoon pinochle games in your retirement community's meeting room. When the local Senior Center had to close on Mondays due to budget cuts, your facility stepped up and offered our group weekly use of the meeting room at an affordable rate of $20 per month, which we have gladly paid in full, on time. 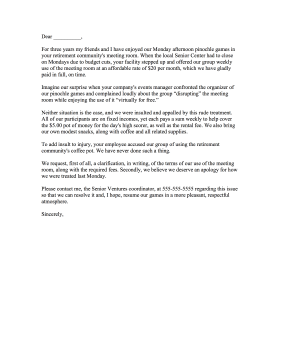 Imagine our surprise when your company's events manager confronted the organizer of our pinochle games and complained loudly about the group "disrupting" the meeting room while enjoying the use of it "virtually for free." Neither situation is the case, and we were insulted and appalled by this rude treatment. All of our participants are on fixed incomes, yet each pays a sum weekly to help cover the $5.00 pot of money for the day's high scorer, as well as the rental fee. We also bring our own modest snacks, along with coffee and all related supplies. To add insult to injury, your employee accused our group of using the retirement community's coffee pot. We have never done such a thing. We request, first of all, a clarification, in writing, of the terms of our use of the meeting room, along with the required fees. Secondly, we believe we deserve an apology for how we were treated last Monday. Please contact me, the Senior Ventures coordinator, at 555-555-5555 regarding this issue so that we can resolve it and, I hope, resume our games in a more pleasant, respectful atmosphere.